THE OBERHAUSEN HORROR CONVENTION MASSACRE (NOVEMBER 2013). – Stigmatophilia's gore splattered corner of insanity. Home › News and upcoming › THE OBERHAUSEN HORROR CONVENTION MASSACRE (NOVEMBER 2013). THE OBERHAUSEN HORROR CONVENTION MASSACRE (NOVEMBER 2013). 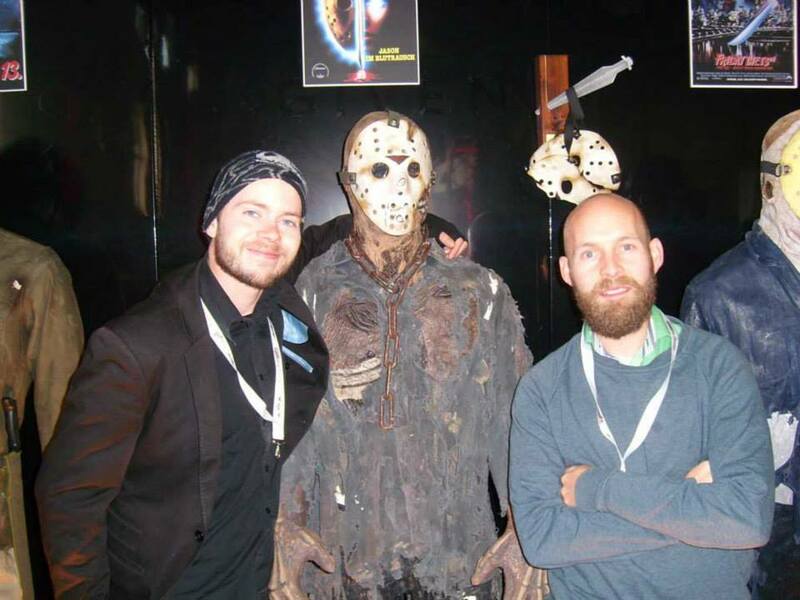 In November of 2013 two Danish comic book creators travelled to the city of Oberhausen to visit Europe’s biggest horror convention, Weekend of Horrors. What you are about to read is an account of the tragedy which befell them. It is all the more tragic in that they were young, but had they lived very, very long lives they could not have expected nor would they have wished to see as much of the mad and macabre as they were to see that weekend in Oberhausen. For them, what should have been the insouciant end to a successful promotional tour for their new graphic novel ”Made Flesh” became a nightmare of dubbed DVDs, decadent celebrities, horror merchandise, cheap beer, bratwurst and 80’s pop music. At first sight, everything looks quiet and peaceful in Oberhausen, an old mining town with a population of around 210.000, located in the Ruhr Area of Germany. 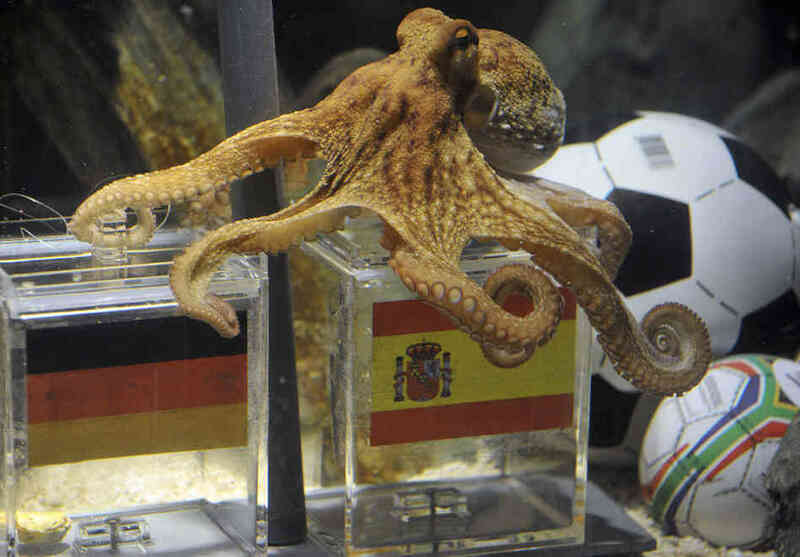 The town doesn’t have a tradition for neither neo-nazis or cannibalism, rather it is known for its annual short film festival and for being the home of the animal oracle Paul The Octopus who became famous in the 2000’s for his ability to predict the result of football matches. But don’t be fooled by this innocent-looking cephalopod claim to fame. A psychic mollusc is not the only remarkable thing about Oberhausen. At least not for the three fateful days in November where the city hosted the largest horror convention (6000 m2) in Europe. The convention took place in the Turbine Halle, Oberhausen, an enormous, gritty factory building located on the outskirts of town, that could easily lead visitors to suspect they had been lured into some kind of Hostel-like trap for horror fans. Upon entering, we can only guess what met the two unsuspecting visitors. A frenzied hustle and bustle of busy organizers trying to get everything ready for the opening, dealers setting up their tables and celebrities starting to arrive, is probably not too far from the truth. It is worth mentioning that the Turbine Halle is as cold as Jigsaw’s basement. While this does add to the atmosphere of the convention, for anyone spending most of their time sitting down at tables trying to peddle DVDs, or in the case of Lars Kramhøft and Tom Kristensen, their comic book, this takes its toll. Thus there is no doubt that the cold started to play a part in the gradual breakdown of the sanity of the two Danes. On several occasions the writer/artist team were heard complaining of the low temperature, one of them remarking on the Turbine Halle’s resemblance of a butcher’s cold room. A bizarre foreshadowing of events to come? Maybe. 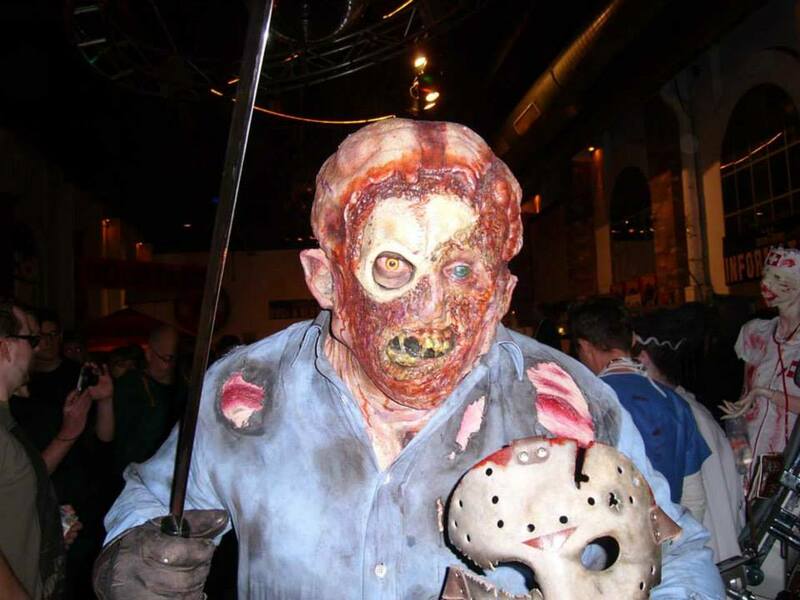 An overwhelming number of guests attended the weekend of horror. In the hours leading up to the official opening at two o’ clock on Friday the 8th, patrons amassed outside the Turbine Halle like brain-hungry zombies outside the last remaining human safe zone in a post apocalyptic wasteland. No doubt the TV-series The Walking Dead, which was featured hugely all over the convention, was one of the big attractions. But what else did our two heroes see? What did they hear? What horrors and humiliations were they forced to endure – apart from their inability to communicate with the locals of Oberhausen who seemed reluctant to speak a single word of English ? We know that Lars Kramhøft and Tom Kristensen early on made contact with Andrew Bryniarski, the actor who portrays Leatherface in the remakes of ”The Texas Chainsaw Massacre”. Bryniarski, who looks more like a roadie for a heavy metal band than an actor, spoke shortly to the two about his role in the films, and can certainly not be considered above suspicion for playing an integral part in their descent into madness. It also seems certain that Lars Kramhoft made several attempts to communicate with the Japanese actress Asami who visited the convention to promote her new film ”Gun Woman”. Were the writer’s failed attempts to communicate with the former adult film star turned Japanese gore girl a cry for help perhaps? An attempt to pass on the knowledge of some horrible secret discovered amidst the madness of the convention? Though Kramhøft was later heard describing the star of such films as ”Horny House of Horror”, ”Machine Girl” and ”Mutant Girl Squad”, as one of the nicest celebrities ever, the truth remains forever lost in translation. Perhaps some light could also be shed on the events of the horror convention by the crew behind the German cult sensation ”Zombies from Outer Space”, an independent low-budget horror film directed Martin Faltermeier (if that is his real name). The film has garnered a cult following in Germany and visitors literally flocked to the tables of the young German director and his crew – possibly also spurred along by the fact that the crew were giving out free beer! However, as of this date the author of this article has been unable to get any comments from both Faltermeier and the rest of the crew. A coincidence? I think not. Their reluctance to contribute to this investigation speaks volumes about their involvement in the case. Perhaps a pivotal event was one that took place on Saturday, shortly following a panel featuring director/producer Sean Cunningham, known for such films as ”House” and ”Friday the 13th”. Cunningham allegedly teased that a new ”Friday The 13th” movie was on the way, and was afterwards approached by Lars Kramhøft who attempted to pitch a Friday The 13th comic book mini-series to Cunningham. The details of the ensuing conversation is largely unknown. Was Sean Cunningham perhaps jealous of the up-and-coming writers bold new ideas, or did a disagreement about portraying Jason Vorhees in drag or not, develop in an aggressive direction? The answer to this, and whose idea it was to put Jason in a dress, is lost in the murky waters of Camp Crystal Lake. Reliable sources, namely the couchsurfers that hosted Lars Kramhøft and Tom Kristensen during their stay, tells us that the two unfortunate comic book creators went out for dinner with one of their hosts, followed by heavy drinking and dancing to 80’s pop songs at a dubious venue called ”Kult Tempel” in Oberhausen on the evening of Saturday the 9th. Why did they not flee while they had the chance? Did some terrible, secret knowledge keep them in Oberhausen? As the convention drew to a close on Sunday the 10th, we can only guess at what unfortunate events proved to be the last nails in the two comic book creators’ collective coffin. The were several times the two left their table unattended, obviously at this point having grown so disillusioned that they had given up any hope of selling more copies of their book. Instead, they attended panels featuring star guests such as Asami, who with help from Kurando Mitsutake of ”Samurai Avenger” to translate questions from the audience, talked about her career, her new movie and how much she enjoyed working on small, low-budget films where everyone on the team pitches in. In closing, Asami thanked everybody for stopping by and saying hello. The author of this article has not yet seen Asami’s latest film, but judging from the poster, which shows a stark naked Asami covered in blood, it is not going to disappoint fans of her previous endeavours. The many otherwise interesting panel discussions were severely hampered by the miserable acoustics of the Turbine Halle, and the fact that bands were often at times playing nearby at the same time as interviews were taking place, sometimes drowning out what was being said on stage. Actor Sid Haig, who spoke about his career, playing next to Sean Connery, getting to throw a naked bond babe out of a window in the James Bond film ”Diamonds Are Forever”, and working with director and musician Rob Zombie on ”Devils Rejects”, joked that the singer of one of the bands shouldn’t quit her day job and that she ought to take singing lessons. What was it that finally caused Tom Kristensen and Lars Kramhøft to flee Oberhausen? Was it the cold? The inability to comprehend the language spoken by the locals? Their hangovers? The fact that ”Lords of Salem” was only screened in a German dubbed version? And why the heck do Germans refer to Godzilla as ”Frankenstein’s monster” on their DVD covers of the old Godzilla movies? Only one thing is certain. The truth is out there. In Oberhausen. Waiting. Other notable guests at Weekend of Horror: Kimberly Beck (Friday the 13th), Michael Biehn & Lance Henriksen (Aliens), Joe Pilato (Day of The Dead), Haruo Nakajima (the actor inside the Godzilla suit in the original Japanese kaiju eigas), Sarah Butler (I Spit on Your Grave), Sid Haig (Devils Rejects), Sean Cunningham (Friday the 13th), Jörg Buttgereit (Nekromantik), Kim Meyers (A Nightmare on Elm Street), Ian White (Aliens vs. Predator) and many more. Lars Kramhøft is an up-and-coming writer of fantasy, horror and comics as well as a lifelong horror fan. He wrote and co-created (with artist Tom Kristensen) the critically acclaimed graphic novel ”Made Flesh” which is slated to be published in the US next year. He is currently writing his first novel without pictures and another one with pictures as well. Gonzo Banebridge might be a psuedonym.